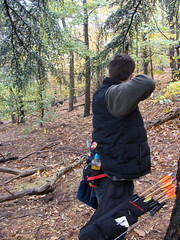 Last weekend Richard and myself and other members of Kings Norton Traditional Archers took part in the Avalon shoot. It was a 40 target shoot, all 3D’s!! We all had a really good time. Phil, the youngest member of our club, did exceptionally well shooting from Adult pegs, and won a medal at the end of the day. I had a pretty mediocre first half scoring 200 but in the second half I scored well over 300 which only served to irritate me when I realised that if I had shot as well in the first half I’d have probably won something too! Regardless of that though it was a really well laid out course and great fun to shoot. As always I have uploaded photo’s from the day to flickr, below are a couple of snaps. 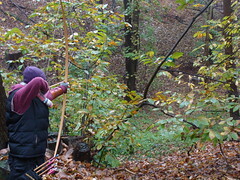 This entry was posted in Uncategorized and tagged archery, nfas, Personal by Nadeem. Bookmark the permalink.